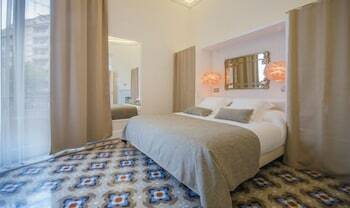 Located in Barcelona (Eixample), Anakena House Modernist Bed and Breakfast is within a 10-minute walk of Casa Batllo and Placa de Catalunya. Featured amenities include a 24-hour front desk, multilingual staff, and a safe deposit box at the front desk. A roundtrip airport shuttle is provided for a surcharge (available 24 hours), and self parking (subject to charges) is available onsite. When you stay at Bungalows Casanova - Costa Calpe in Calpe, you'll be within a 10-minute drive of Llavador de la Font and Cala Morello. Free self parking is available onsite. With a stay at Apartment Plaza Castillo in Pamplona (Old Town), you'll be steps from Café Iruña and Plaza del Castillo. When you stay at Apartamentos Habitat in Alcala de Xivert, you'll be near the beach and 6 minutes by car from Natural Park of Serra d Irta. With a stay at Posada Real Quinta San Jose in Piedralaves, you'll be within a 15-minute drive of Castillo de La Adrada and Canto de los Pollitos. Free self parking is available onsite. Madrid SmartRentals Chueca II is in the heart of Madrid, within a 5-minute walk of San Anton Market and Plaza de Chueca. Featured amenities include multilingual staff and an elevator (lift).